To have closely followed the 2008 campaign that culminated in the election of Barack Obama is to have read a million articles. But now that it's the weekend, let's look at the proceedings from a bird's eye view: How did we get here and what does it mean? To help answer those very daunting questions, host John Moe is joined by author David Rakoff. Moe and Rakoff were a book fair two years ago when they first encountered Barack Obama in somewhat surreal surroundings. We also check in with Claire Petersky, a former college classmate of Obama's who went on to be one of his first campaigners in the presidential race. 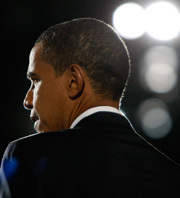 Barack Obama was elected president on Tuesday. Like you, I followed this election closely. It was compelling. There were strong characters, like Sarah Palin and Reverend Wright and Joe the Plumber and Obama and McCain. There was conflict and high stakes drama. I obsessed over every detail. I'm still trying to make sense of it. In our nation, with a tradition of presidents named William and George and John, we just elected a Barack. Whose last name is one letter away from Osama. And whose middle name is Hussein. And who, yeah, is black. Obama's also the kind of person who gets elected president. Editor of the Harvard Law Review. Constitutional law professor. Freshman senator but still: senator. It's telling that Obama is the author of a book, "Dreams of My Father," about his quest for his own identity. No one with an identity like his has ever been president. Claire Petersky of Bellevue, Wash. learned Obama's identity earlier than most of us. In California in 1979. "I was at Occidental College and he was, too. We were both political science majors, both freshmen. And he was in my American Political Ideas and Institutions class," she recalls. I can imagine her sitting in a discussion group with an 18-year-old version of the guy who just got elected president - maybe in different clothes, but with the same focus and speaking style. How different was he? "I was personally a little bit intimidated by him because he said he went to a prep school in Hawaii," Petersky says. "I didn't come from as lofty beginnings. He looked a little preppy, but he was kind of laid-back and Hawaiian. He got along with everybody, unlike a lot of the other black students who only hung with other black students. He seemed to be comfortable with everybody on campus." I ask Petersky if she remembers what kind of things Obama would talk about. "You know, a lot of poli-sci students are interested in politics and especially changing the world when you're young and idealistic," she says. "He was one of those people too, who was very concerned about the issues, but he didn't just stop there. In 'Dreams of My Father,' I thought he was very harsh on himself, saying he didn't think he took things out into the world enough. Because I thought he was very active in politics - he was active in anti-Apartheid work at Occidental. I thought he did a lot." Did she remember thinking, this guy could be elected president some day? "No. I remember thinking he was a bright, affable guy. But I didn't think he would be president someday." Obama transferred out of Occidental. Claire didn't give him another thought. Until 2004 when Senate candidate Obama spoke in support of John Kerry. "I was actually shocked when I saw the Democratic National Convention, and I listened to that fabulous speech," Petersky says. "And it somehow hit me right in the middle: 'Oh my God, that's Barry!'" Right. Whatever happened to Barry Obama? "Well, I just found out," Petersky says. I found out a while ago, too. I had heard of Obama, saw that '04 speech. I thought, "Interesting guy, good speaker. OK."
Then I went to Austin, Texas in October of 2006. I had been on a book tour and it included a stop at the Texas Book Festival where I was to appear in a panel discussion alongside David Rakoff, who you hear on our show all the time. David and I were to speak in the capitol building, in the Texas state senate chambers. And as our audience assembled, it consisted of a few people there to see me and David, and then a bunch of disappointed looking people in back with folded arms who had tried unsuccessfully to get into the jam-packed event being held in the Texas state house chamber. That's where author Barack Obama was giving his talk. You know how on game shows the winner gets a new speedboat and the loser gets a case of Turtle Wax? David and I were Turtle Wax. And this was a big event, with lots of authors you've heard of. We were all Turtle Wax. "Don't you remember the charisma about him? We didn't see the guy in the building, and the charisma was just leaking down the halls like gas," Rakoff recalls. Rakoff goes on: "Then do you remember what happened? We were inside this tent - and it was very hot, though the tent had netting on the sides to let the air through - and then on the grounds outside, Obama walked by. People stopped on hillocks and walkways and spontaneously applauded as he went by." I remembered it as a kind of a roar, a guttural moan of recognition. "It was like a magnet going over iron filings," Rakoff says. "The fact that I saw him through cheesecloth emphasized the 'it-never-happened' feeling of that day. It was a gauzy memory." Up until Election Day, Barack Obama was an abstraction. He was someone who could fix the economy or someone who could turn it socialist - hope or threat. "I have a confession to make. So no, I didn't vote for Barack Obama. I voted for a boy who now has every reason to believe he, too, can grow up to be anything he wants - even President." Boyd Reed is a software tester in Turtle Creek, Pennsylvania, and his essay first appeared on www.talkingpointsmemo.com. Think about what we saw after Obama won Tuesday night. People dancing in the street, weeping, hugging each other. Have you ever seen that as a result of a presidential election? But it makes perfect sense. Here was a guy talking about how America is going to get better in a calm and reasonable way. Given our two wars and our economy, there was no way he was going to lose this election. Candidates who are more positive about what's ahead win. Look at J.F.K., Ronald Reagan, Bill Clinton. And now Obama. Here's something Barack Obama said Tuesday night. "To all those who have wondered if America's beacon still burns as bright: Tonight, we proved once more that the true strength of our nation comes not from the might of our arms or the scale of our wealth, but from the enduring power of our ideals: democracy, liberty, opportunity and unyielding hope." When I listened to Mr Reed's experience in the voting booth on my local NPR radio station, I got shivers down my spine and the hair on my arms stood up. I was moved emotionally. I sat in my car before going into the store Saturday morning and........just sat there. I couldn't move. Then when I got home I spent over two hours searching the internet for a transcript of his essay. ( I am not very computer savvy, the average person probably could find it in 5 mins!) I needed to be able to read it over and over. It will inspire me and I hope others to keep the promise we collectively made to our nation and our future by voting for Barack Obama.